Android seems to be everywhere these days. While we're still eagerly awaiting for it to appear on toasters (and toaster-fridges), at least we now have it running on full-fledged laptops. 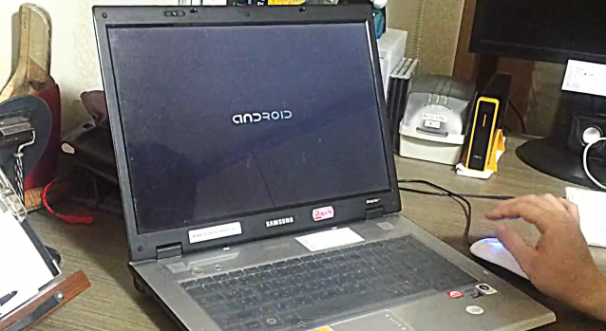 YouTube user leemgs has posted a video of Android 4.0.4 (Ice Cream Sandwich) running on their Samsung R60+ laptop. They say they've spent their free time in the past month or so porting ICS to x86 because Android's battery support is better than that provided by Windows and existing Linux distributions. It looks like a shockingly pleasant laptop environment. Most Android games appear to run fine on this modded laptop, so if you've ever wanted to play Angry Birds Space on a device larger than your phone without shelling out for an iPad or a Kindle Fire, now's your chance. This isn't the first time Android has been seen running on x86 hardware--android-x86.org hosts an apparently fairly active porting effort, including a release candidate version of Android ICS released in February. That group's original motivation was to get Android running on Asus EeePCs and other netbooks. Providing a larger and more touch-friendly user interface better-suited to devices with small screens is also one of the goals of Ubuntu's new Unity interface project, formerly part of Ubuntu Netbook Remix edition. Is the old-style desktop going to stick around? Or is your next laptop going to come pre-installed with Android? Only time will tell.